Tina Yates and Interactive Mortgage 07 topped the field in this weekend's $25,000 Markel Insurance Grand Prix. Tina Yates aboard Interactive Mortgage 07, owned by Evette and Gregg Delong, topped the field in this weekend’s $25,000 Markel Insurance Grand Prix. Course designer Catsy Cruz of Mexico built the 1.45m track on the Oaks International Grand Prix Field, consisting of sixteen jumping efforts, including a double and triple combination. An enthusiastic crowd cheered on thirty rider/horse combinations with only three making it through to the jump-off. Kendall Bourgeois aboard Colin 4, Andrew Jayne on Cartel and Tina Yates and Interactive Mortgage 07 each navigated the first round with a single time fault, resulting in an exciting three horse jump-off. Bourgeois laid down a fast pace, going first in the jump-off in 38.274 seconds with four faults. Jayne followed with a clear round in 41.011 seconds, leaving a window of opportunity for Yates to take the win. Yates rose to the challenge, answering with a fault-free round in 39.417 seconds. 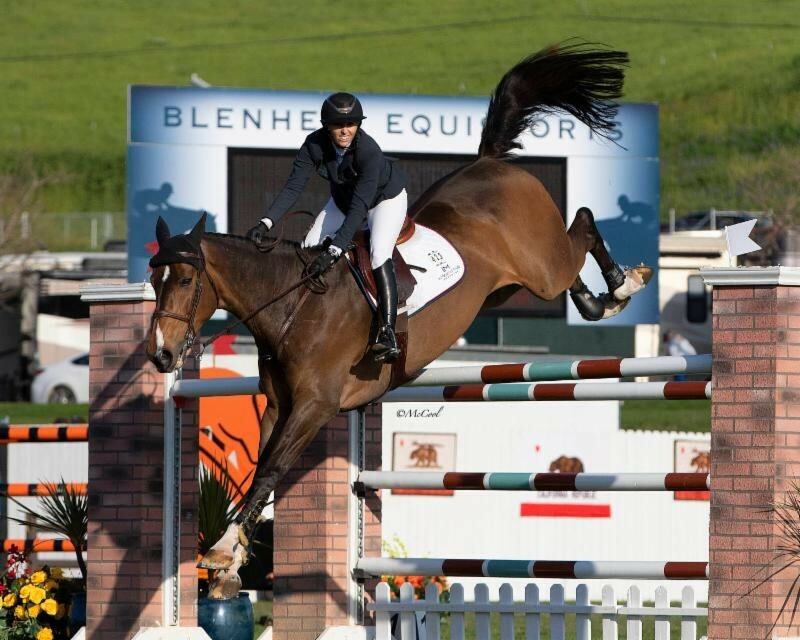 This is the first of thirteen qualifying events in the Markel Insurance 1.45m Jumper Series to be held throughout the Blenheim EquiSports 2019 Horse Show Season, with the Final to be held during The Las Vegas National, November 12 – 17, 2019. Stay tuned for the second week of the Blenheim EquiSports Spring Series, featuring the FEI CSI 3* schedule, which includes three tours – Bronze, Silver, and Gold – and culminates with the $100,000 1.50m Gold Tour Grand Prix. In addition, the Blenheim Spring Classic II will host the the Zone 10 NAYC Young Rider Trials and an USHJA National Hunter Derby.